Click on the cover for more information or to order a copy of The Infected. I reviewed The Infected #1 several months back, and was impressed with the interesting story, concept, and visual design. I finally got a chance to read the last three issues, and I am happy to share my thoughts with you. In issues two through four, the protagonist Jacob, his sister Chloe, and the veteran hero Freedom are still on a quest to find answers, while trying to survive, by avoiding flesh eating monsters and governmental military forces looking to eliminate all super powered beings. Chris Hartmann did an excellent job of creating a world full of drama and suspense, where certain death and peril can be around any and every corner. The tension is heavy and is successfully carried from panel-to-panel, page-to-page, and issue-to-issue. Some interesting new characters were introduced in issues two through four, including Legend, Deadhead, Mega, and Sun Fang. It is apparent that a significant amount of time was spent in creating each character, as each one has his or her own distinct personality, which allows for a great team dynamic, and engaging dialogue between the characters. We did get some information related to Freedom’s background. That being said, I would expect to see a little more sibling interaction between Jacob and Chloe in future issues, in order to provide further insight into their relationship, individual personalities, and backstory. Also, this would create some opportunities for some heartfelt moments. If you read my review of issue number one, then you will know that I was a big fan of the issue’s art direction. I am happy to say that the same visual style was consistently carried through issues two through four. 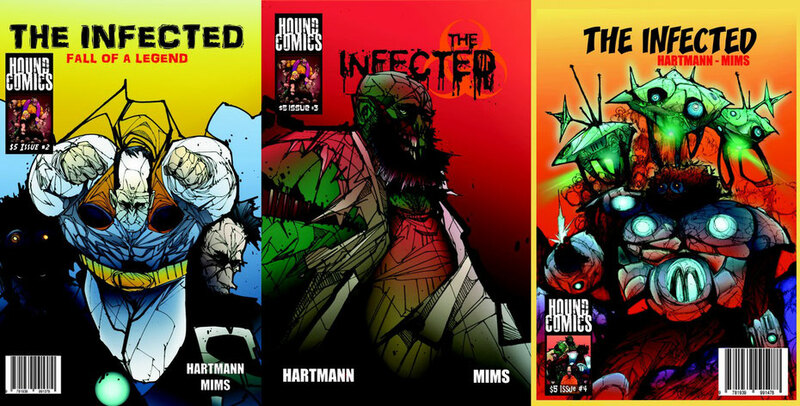 While admittedly unconventional by most comic book art standards, Dave Mims’ dark, gritty, and intense art style perfectly complements The Infected series. As much as I enjoyed The Infected comic, there were some issues that I have to mention. In my previous review, I mentioned that the pacing was a tad too fast. I don’t consider that an issue (no pun intended) with the latest three issues. Now my concern is that things may be taking a tad too long to develop. I am four issues into the series, and still have no clue as to what happened to Jacob prior to his awakening in the deserted hospital, what his true abilities are, or how he obtained those abilities. I am also clueless as to how the outbreak started, and who is really behind it. I don’t expect total revelation just four issues in, but the suspense has been built up, and a little more disclosure, or a few clues here-and-there would have been great to help the reader put some of the pieces of the puzzle together. Also, some readers may be a little disoriented by the panel layout and word bubble arrangements. Not all of the panels on the page are perfectly aligned in the standard left-to-right, top-to-bottom configuration, which could make some of the action and conversations a little difficult to follow for less experienced comic book readers. Finally, there were a few grammatical issues and misspellings in a few areas. For instance, ‘to was used instead of ‘too’ in a few places, ‘of’ was used instead of ‘off’, ‘new’ was used instead of ‘knew’, ‘your’ was used instead of ‘you’re,’ and in another area, the word ‘you’re’ was misspelled as ‘you’r.’ Special care should be given to proofreading future issues, prior to publishing. Small issues aside, this is a really good series that I am looking forward to following. I have enjoyed reading each issue, and I am sure that you will too. Don’t hesitate to pick up your copies today.